A bag full of white asparagus is laying on my kitchen top, so crunchy and fresh, that its juices start running as soon as I cut the bottoms off. Their short season which ends in late May or early June has just started. It’s a delicate gem, also referred to as the royal vegetable, white gold or edible ivory. While green asparagus grows above the ground, the white shoots stay covered in soil and ripen in the dark which prevents photosynthesis, hence the white colour. 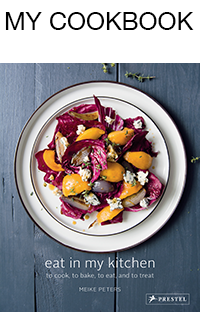 This technique is called blanching in horticulture, it creates a delicate flavour and makes them tender and less bitter. 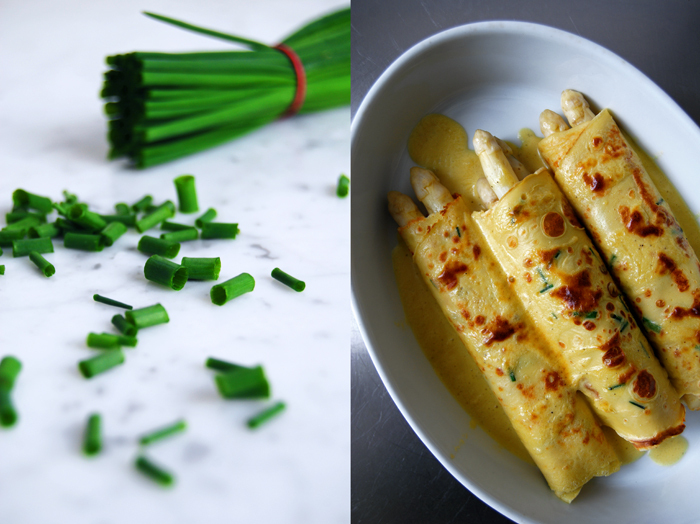 Unlike their green relatives, white asparagus has to be peeled and also needs to cook a little longer, around 8 minutes to keep them al dente. One of the most common recipes which puts the focus on the pure taste of the asparagus, is white asparagus served in brown butter with breadcrumbs and slices of cooked ham and new potatoes on the side. A very popular variation on this meal which is also my favourite, is to replace the butter with a sauce Hollandaise, homemade of course as it’s not as complicated as one may fear. The taste of this sauce, buttery, eggy, enhanced with Dijon mustard and lemon brings the best out of this royal vegetable. There is some helpful information put together on Food52 for dressings which demand emulsification like sauce Hollandaise or aioli. 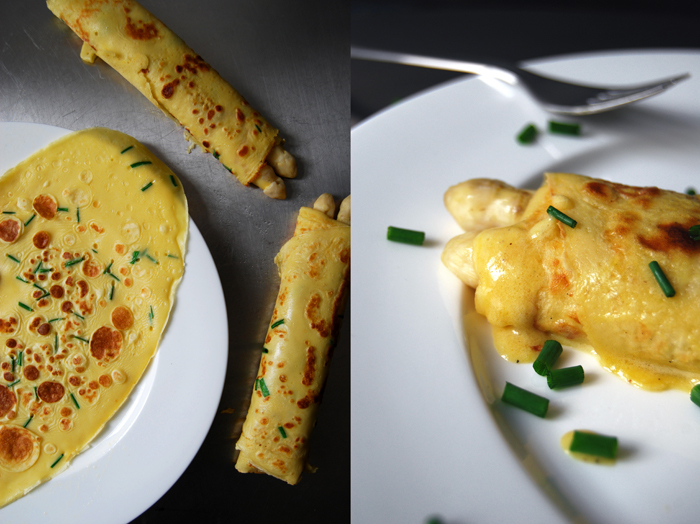 I wrapped my first white asparagus of the year in thin crêpes with chives and baked them with a thick and fluffy sauce Hollandaise under the grill, just for a few minutes until it had a golden bubbly crust. In a large pot, cook the asparagus in plenty of salted water for about 8 minutes till al dente. 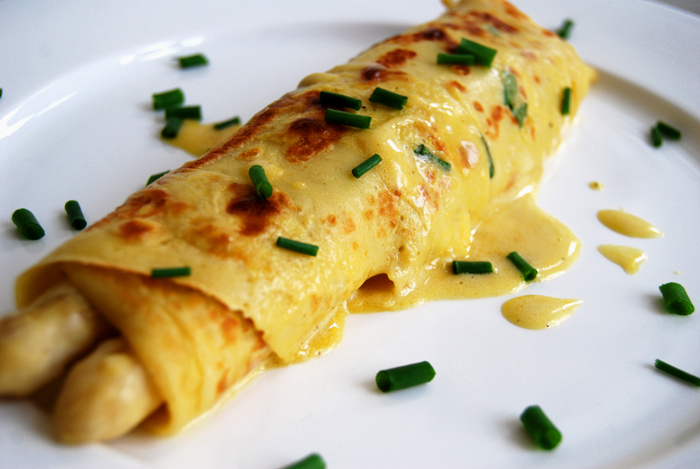 Whisk or mix the ingredients for the pancakes until well combined, stir in the chives at the end. 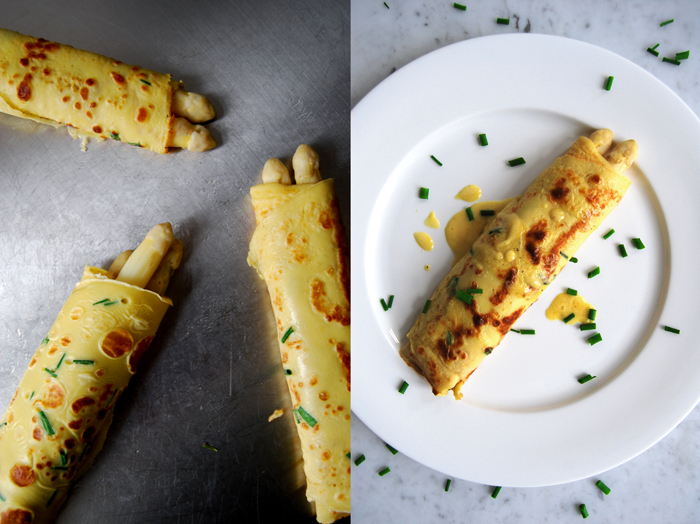 Fry the crêpes thinly in a large non-stick pan in a little butter for 1-2 minutes. They should be golden on both sides. In a sauce pan, whisk the egg yolks with the water, lemon juice, mustard, salt and pepper for the sauce Hollandaise till fluffy. Put the pan on a low temperature, the pot should become warm but not hot. Whisk the melted butter into the egg mixtures, adding just a tablespoon at a time and whisk well in between. If the sauce becomes too hot, take it off the heat immediately or add a little more water. When its all combined continue whisking for 1-2 minutes, off the heat if it’s already thick and creamy or on the heat, but mind the temperature. Season with salt and pepper and more mustard to taste. 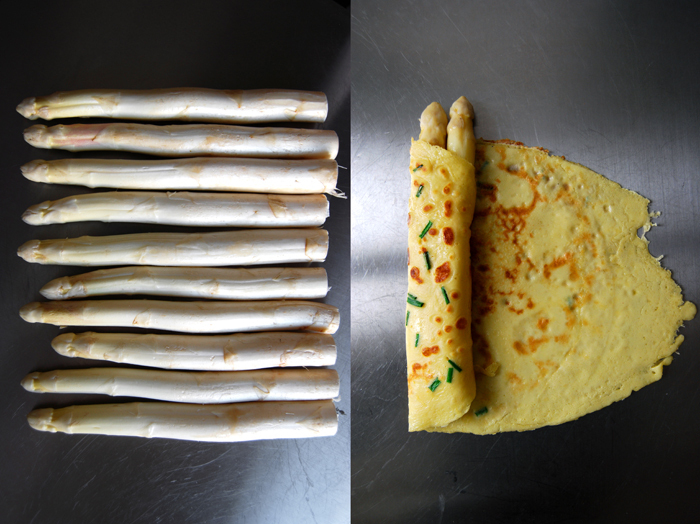 Roll 2-3 asparagus in each crêpe, put the wraps flat onto a large baking dish and pour the sauce over it. Bake under the grill for a couple minutes until the sauce starts bubbling and turns a golden brown. Serve immediately. If you don’t need all of the sauce for the asparagus you can keep it in the fridge until the next day and eat it with potatoes or mixed in an omelet, both are great with chopped chives! This recipe was delicious! I found specially interesting the mustard in the hollandaise sauce, what gives it a different touch. 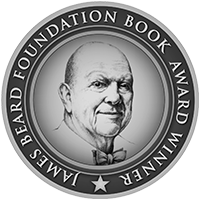 Really worthy giving it a try! Btw, I’m also fan of your Bittersweet Chocolate and Orange Sponge Cake. I already made it two times and everybody loved it! Thank you Marta, I’m happy you enjoyed this recipe! It’s true, the mustard adds a nice spiciness to the sauce, I love it! The chocolate orange cake is one of my favourites as well, I’m glad that my boyfriend’s grandmother shared the recipe with me!